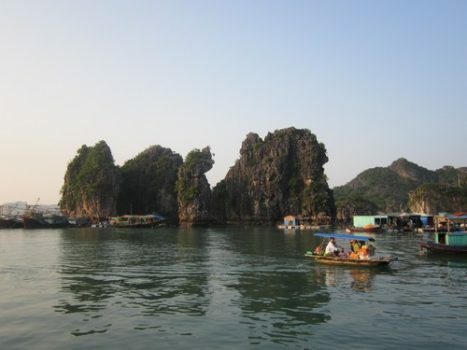 Upon your arrival at this spectacular natural wonder, in addition to being able to admire the breathtaking landscapes of the nature, you can also experience various popular but stunning things to do in Halong Bay. The squids which you have just caught will be used for making dishes. 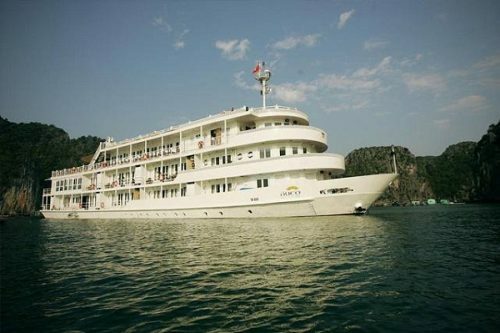 This is an interesting chance to experience Halong Bay by night. At night, the sea water’s surface is shining brightly with the twinkle light from those cruises that were anchored on this bay. The boiled whole squids are really favored by the international tourists because upon eating, they could have the amazing feeling of ink line which breaks out coal-black within their mouth. 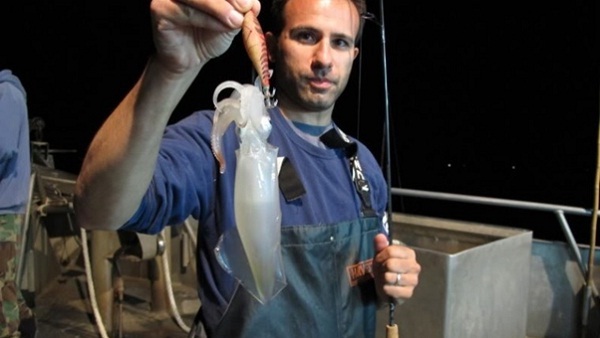 Whilst singing Karaoke or dancing they could also eat these squids. With just a little bit liquor barm, all tourists can become enthusiastic and excited singers and dancers. 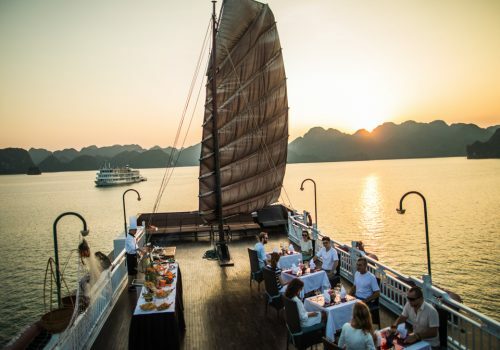 Among many things to do in Halong Bay, holding a BBQ party on the beach should be one of your gastronomies. 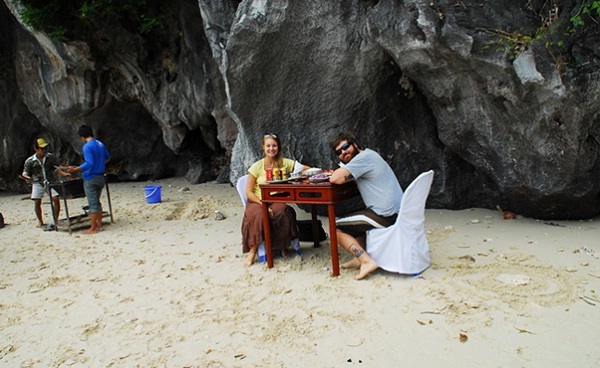 You will definitely have a unique experience that you cannot find anywhere else while having BBQ on one of various beautiful beaches of Halong Bay. It is very promising for anyone to have an incredible and tasty meal featuring many kinds of fresh meat and seafood dishes such as: grilled beef rump, roasted chicken and baked king prawns in the bay of islands. Let’s imagine, in the romantic light of the dawn, you and your lovely partner have a delicious BBQ party and sip excellent cups of unique cocktail or wine, surrounded by evergreen and lively islets, long white sands, and the turquoise sea. You will not be able to to resist, right? Although not being the only magnificent place for sightseeing in Vietnam, Halong Bay is certainly an ideal destination for adventurous sports. 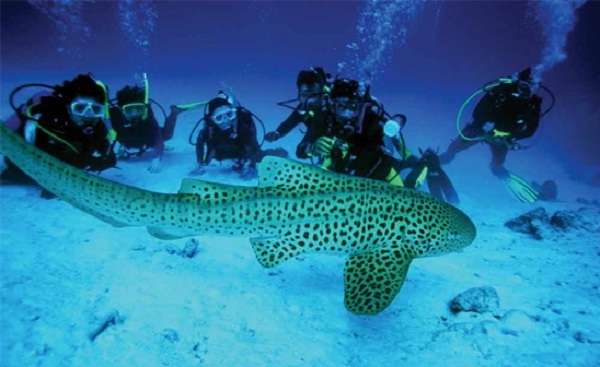 Besides the stunning boat trip, Halong Bay also offers tourists scuba diving opportunities. Although just having been opened recently, scuba diving in Halong Bay has become one of the most exciting activities to do in Halong Bay, especially for those who would like to discover the underwater life. The period from April to December when the water temperature ranges from about 26 to 29 degrees, is the most suitable time to enjoy scuba diving in this bay. .